Have you added any powered accessories to your Victory ride? In recent years I've added several electrical accessories to my 2008 Vision including a Stebel air horn, a Kuryakyn 4710 run-turn-brake controller modification to the trunk running lights, and an amplified antenna. Since I will be adding more electronics outlined in this article and others in the future, I decided to add accessory power using a fused power distribution block that is separate from the Vision's wire harness. I will feed the fuse block with ten gauge wires, fused on both the positive and negative lines, that will run from the battery to inside the right saddle bag. These wires will terminate to a 45 amp Anderson Power Pole connector and plug into a fuse block (in this case a Power Werx RIGrunner 4005H block). To start, I drilled a hole in the saddlebag to allow the power wires and the speaker wires into the bag. From the inside of the bag, the hole is in the upper right back corner of the bag. I drilled it after I removed the seat from the outside of the bag. This looks like the best place to seal the hole with a grommet and should get less water splashing into the bag. I decided to buy all of the parts for the fuse block off of the shelf. 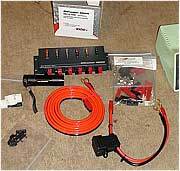 As an Amateur Radio Operator (Ham), I have been connecting 12volt radios and accessories for over twenty-five years and I have not found a better connector then the Anderson Powerpole. Setup correctly the connector is very close to idiot proof. 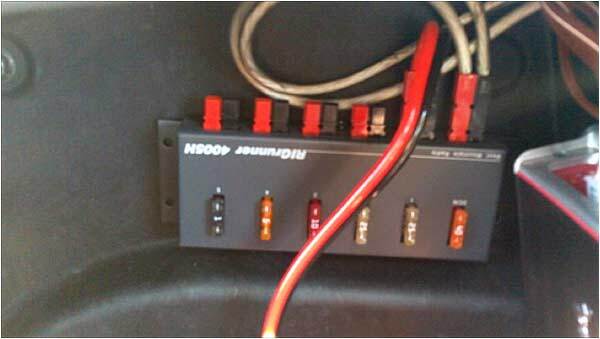 The 15, 30 and 45 amp connectors all share the same physical shell and differ only by the contacts used. You can even plug the 15, 30 and 45 amp connectors into each other. 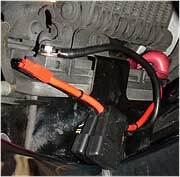 To connect to the battery, you can use an off the shelf parts from Powerwerx.com. The wire has 1/4 inch gold plated rings on one end a fuse holder on each wire and a 45 amp Powerpole on the other end. It comes with two 40 amp fuses installed. If you do not want to crimp your own cable have Powerwerx make one for you. It takes an 8 foot cable to go from the battery, up the left side of the cast frame near the key and then back to the right saddle bag. Powerwerx can make you a custom cable with any connectors they have just about any length and ship it to you. I wanted a distribution block that was fused and small so it could fit in a small space like my saddlebag. I picked the RigRunner 4005H for the job. Using 3M Very High Bond (VHB) tape I stuck the block on the back of the saddlebag. You can get VHB tape at the auto parts store in the body repair section. Vision-Rider.com member "flint350" created an excellent post in our forum with pictures using the Fuzeblock fuse block. It is small enough to fit in the XM Radio cubby on the right side of the Vision. With a 30 amp capacity, it should handle almost any accessory you wish to add. Now I had an easy way to distribute power to my accessories. While this was not the cheapest solution that I could install, it is nice looking and well built. You could install a Fuzeblock fuse block as an alternative to using the RigRunner and PowerPoles (see sidebar). 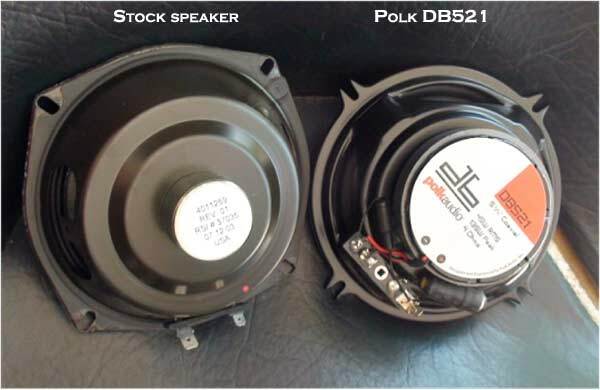 I decided to upgrade my speakers with Polk Audio DB521's. These really fit my tastes but there are many out there to choose from. 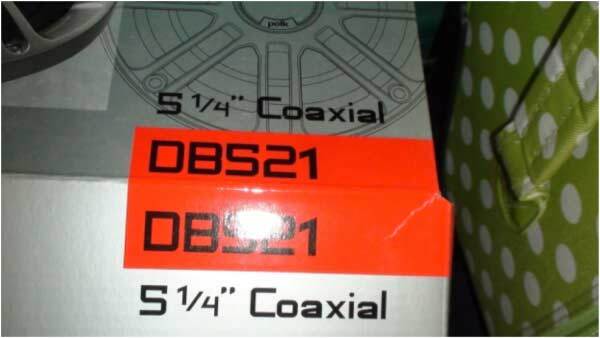 I picked the DB521's because they were cheap, (paid $104 for all four including shipping from Amazon.com), they are Marine Certified so getting wet is not an issue, and they fit with little to no modifications. Changing the rear speakers is easy. Take off the rear speaker grills by removing the two screws on the top of the grills and slide each grill forward. There are two screws per speaker. 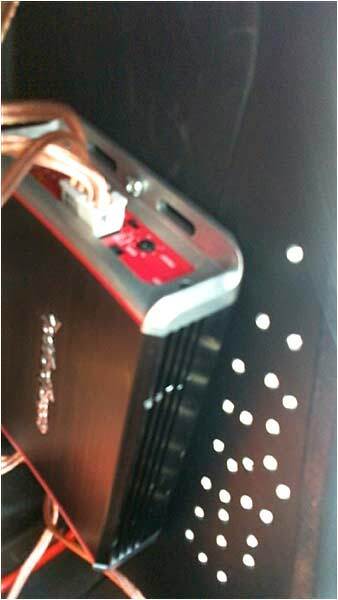 Be careful not to lose the short spacers that go between the back of the stock speakers and the Vision. You will want to use them on the replacement speakers. In a full week of operation, I broke both of the rear speakers. The inductor for the crossover that feeds the larger speaker became unglued from the speaker. The loose inductor moved so much from the vibration of playing loud music the wire broke. I glued the part down with Gorilla Glue and then re-soldered the wire. The speaker lived to play again. I could have sent it back for warranty repair but where is the pride in that? On the Vision radio, I set the fader balance to provide slightly more output to the rear speakers since they are at a disadvantage of having to push the sound into the oncoming air. I was trying to make up for that and provide more bottom end to the mix. To access the front speakers involves a little more work. Remove the instrument bezel. Pry it off with a non-marring tool. The radio can stay bolted in place. Remove the front blade (access panel in front of windshield). Pull it up at both ends and disconnect the antenna lead. 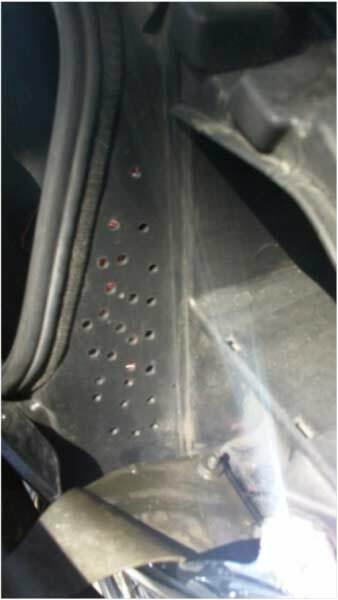 Remove the front mirrors by removing two bolts (for each mirror) from the back of the mirror housing. Remove one bolt using a 6mm hex and the other with a 10mm socket. Remove the front speaker grills. Three 4mm bolts and a gentle pull. Now you can see the front speakers. Be gentle removing the front speakers. They are held in by screws that go through rubber cylinders that have brass inserts with the threads in them. If you push the hex wrench in with any force the lip on the rubber cylinder will push out of the hole and spin (not good) so go lightly. After removing the screws you have to reshape the speaker enclosure to accommodate the larger magnet on the new speakers. Use some clamps to hold the enclosure in place and heat it up with a hot air gun. (They sell hot air guns at Harbor Freight for less than $10 on sale). Use a cold wrench to reshape the enclosure. It should not require much reshaping. I used a dab of Gorilla Glue between the rubber cylinders and the inside of the enclosure to keep the cylinders in place and stop them from spinning. After the glue dried the cylinders worked great and held the speakers and the enclosure in place. Without the glue it was very frustrating trying to install the speaker bolts. The new speakers sound great. They have almost no distortion at any volume setting. The highs are crisp and the mid range has a lot more definition. The only issue is that they produce less overall volume than the stock speakers using the stock radio output. This lower output, but better sound, is typical of replacing stock speakers with higher performance speakers. If you can live with the lower volume, you're all set and can begin reinstalling the parts. If not, consider adding an amplifier such as in the next section. 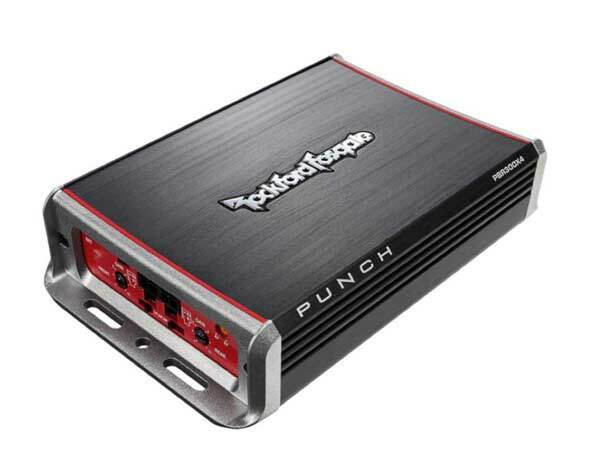 This year Rockford Fosgate came out with a new Punch Amplifier, the PBR300x4 with some great features. It is the size of a medium sized paperback book and produces 75 watts into each of four 4 ohm channels (300 Watts). It comes with connections for Line In audio and if you cut off the RCA jacks it can connect directly to the Vision's speaker level outputs. No line converter required! I bought mine from Amazon.com for under $170 delivered. The input of the amplifier can be adjusted to accept voltages from 150 millivolts to 11 volts. That's how the amp can connect to either "line in level" to "speaker level" connections. 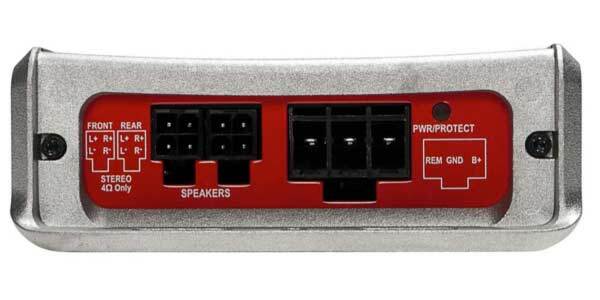 So you can connect the speaker lines from the Vision's radio directly into the input of this amp and connect the output of the amp to newer better speakers. I set both the front and the back channels so that the white dot on the control pointed to "4". The amp also has a switch for both the front and back channels that can be set to Low Pass, All Pass and High Pass. The low pass is better suited for true Sub Woofers. I left this setting in the "AP" All Pass position. 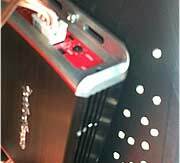 Using "high level inputs" delays the turn on of the amplifier eliminating induced noise, turn on/off pop. 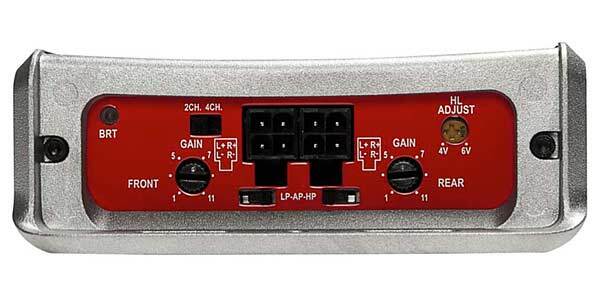 In a high level(speaker) input application, the amplifier can be turned on/off allowing the REM connection to be used as an output to turn on/off an amplifier or other accessory. In other words, since I used a high level input, the PBR300X4 will turn itself off and on. Also, you can now use the REM input as an output to turn other things on and off like a key switched circuit. 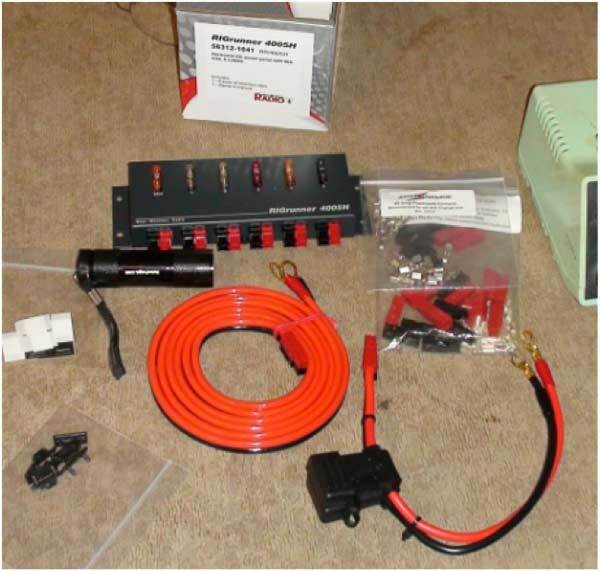 The PBR300X4 requires a 30 amp connection to a 12 volt source but will typically draw 15 to 20 amps (View the PBR300x4 Manual). Here is a good use for my new fuse block! I mounted the amp inside the right saddle bag with one bolt at the top of the amp and two strips of VHB tape. After some initial testing I took a 45 minute run in 106 degree heat. Using a no touch laser thermometer I measured the temperature of the amplifier to be 175 degrees Fahrenheit. Wow! I then drilled a series of holes to ventilate the saddlebag. I opened the saddlebag door and drilled some holes in the front lip behind the seal so air can get in and did the same on the rear of the bag near the lip so air can escape. Plan A: Harness abuse. I could cut the eight speaker lines and add 16 splices under the dash. Nope, I do not want to do that. Plan B: Maybe I can build a wiring harness to plug into the radio and let the bikes harness plug into a mating connector on this new harness? For two weeks of spare time I designed a harness, created a schematic drawing, researched the connectors, tools and parts required. Then I found out that one of the connectors required is back ordered for months. I cannot wait this long. I want it now! Plan C: Finally, I settled on running an input pair and an output pair to each speaker area (no harness abuse) using 16 gauge wires. Incidentally, the wire sizes were on the specification sheet for the amplifier. One pair has blades on it to mate with the radio outputs (input to the amp) and the other one connects to the speaker. This not the elegant solution I wanted but it will have to do for now. 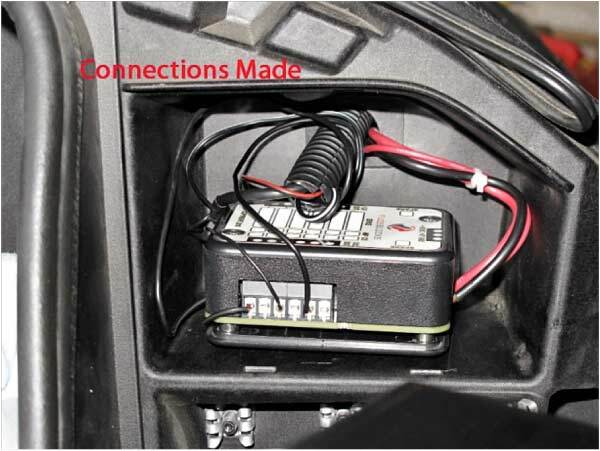 Someday when I can obtain the proper connectors for Plan B and I will make the wiring harness for a true plug and play solution between the Vision and the Rockford Fosgate PBR300X4. I now have a clean way to add 12volt accessories without tapping into Victory's wiring harness. Uncle Ben from Spiderman said, "With great power comes great responsibility ". The Polk speakers sound great but one has to be careful since this amp can overdrive and destroy the speakers. If you hear the sound of the speakers hitting the end of their travel, back off the volume or the bass level until you hear undistorted bass. Read the manual for the Rockford Fosgate amplifier before starting the project. It has all of the tips and warnings that I did not include in this article that you really need to know. This amp still runs a bit hot but the vent holes I added dropped the temperature to an acceptable level. I would still be concerned if I packed this saddle bag tight so no air would flow over the amp.